Cardiac catheterization (angiogram) is an invasive procedure done to confirm or evaluate the presence and extent of certain diseases of the heart. It also helps your physician to determine if any further treatment is necessary. The procedure lasts about 30 minutes. However, you will need to stay in the hospital one whole day recuperating. Preparation for the procedure involves not drinking or eating for around 6-8 hrs prior to the test. The doctor will take a history of any medications intake and allergies. A sedative will be given to help you relax but you will be awake throughout the procedure. After giving a local anesthetic in the groin area or arm, the doctor will pass a catheter (a long and thin tube) through a blood vessel in the groin or arm. This catheter will then be threaded to the blood vessels of your heart. Then a dye is injected and X-ray films are taken. Bruising or bleeding can occur, usually around the site of catheter insertion. This risk is greater if you are already taking blood thinning medications. To prevent the risk of bleeding after the procedure, firm pressure is applied over that area for 5 to 10 minutes. You should not move the leg or the arm used for catheter insertion for a few hours after the procedure to reduce this risk. Bleeding tends to get controlled within a few days. Usually, if bruising occurs, it fades away in 3-4 weeks. Avoid strenuous physical activity and driving for a couple of days following the procedure. 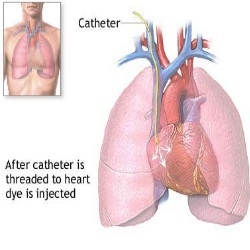 There is risk of an allergic reaction to the dye given during the procedure to image the heart. It usually occurs in one person out of 1000 cases on whom angiogram is done. However, the risk of allergic reactions is very small, and when they do occur they tend to be not very serious. Watch out for symptoms of an allergic reaction and report them promptly to your physician. The symptoms are headache, nausea, skin rash and visual disturbances. The risk of a heart attack following the procedure is 1 in a 1000 cases on whom angiogram is done. The reason for this is if a clot is formed during the procedure, it can block a blood vessel supplying blood to the heart. Thus, decreased blood supply to a portion of the heart muscle leads to chest pain, signaling possibility of a heart attack. This risk is reduced by giving a blood-thinning medication like heparin. The chance of death due to the procedure is 1 to 2 in a 1000 cases on whom the procedure is performed. However, if your general health is very good prior to the procedure, the chances of this occurring are less. Death usually occurs in those patients whose clinical condition is very poor even before the procedure is performed. You may have a stroke as one of the complications after the procedure. However, this complication occurs only in one case out of 1000 on whom angiogram is done. Blood clots can form during the angiogram procedure. These clots can then travel to brain through the bloodstream. They can then lodge in small blood vessels in the brain and block them. This cuts off blood supply to the area being supplied by the blocked blood vessel. This leads to a stroke because a part of the brain function is impaired. To reduce this risk you will be given a blood-thinning medication like heparin. Around 1 in 1000 cases will require an emergency angioplasty or coronary bypass surgery. In about 1 in 500 cases, the catheter used in the procedure could damage or perforate an artery. This will require surgical repair. Heart rhythm can get disturbed (arrhythmia) due to the procedure. Heart may start to beat either too slowly or too quickly. If that happens, you may need medication.